They say that good things come in small packages, well, that’s certainly true of the Bentley Priory Museum. Nestled in the leafy, North London suburb of Stanmore, the Bentley Priory Museum is housed in a Grade II listed building that was once Headquarters of RAF Fighter Command. It was from here that Air Chief Marshal, Sir Hugh Dowding directed the Battle of Britain in the dark days of 1940. The RAF officially left Bentley Priory in 2008. Renovation work on the beautiful Mansion House was completed in 2012. The museum finally opened its doors to visitors in 2013. You can buy admission tickets from reception, which also doubles as a small gift shop. Adult single admission costs £8.80 at the time of writing with family tickets, senior and armed services discounts available. After purchasing your ticket you will be furnished with a simple map of the museum layout. Before starting your tour proper, it’s advisable to watch an excellent ten minute film that briefly explains the leadership role of Air Chief Marshal, Sir Hugh Dowding, Commander-in-Chief of RAF Fighter Command, during the Battle of Britain. The film is screened in the anteroom to Hugh Dowding’s office. Sadly, due to a number of thefts, visitors can no longer enter Dowding’s office, but you do get a tantalising glimpse into the room during the film. 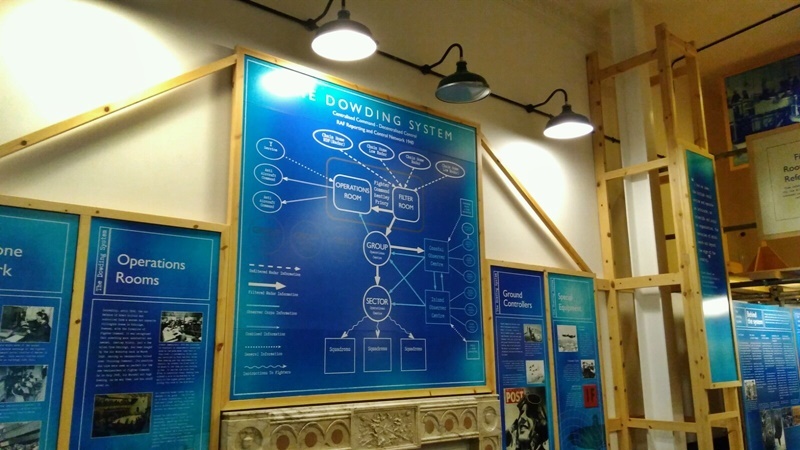 Dowding oversaw the development of the world’s first integrated air defence system. The complex system relied on early Radar technology for detection, Filter and Operations Rooms to process incoming data, and RAF Group Headquarters to direct intercepting fighter aircraft. This brilliant combination of organisational ability and technical innovation made the Dowding System so decisive during the Battle of Britain. After watching the film, make a point of taking a look the two-page letter from Dowding to Prime Minister Winston Churchill that hangs on the wall by the film room door. The letter rationally argues the case for holding back a significant proportion of the RAF’s fighter squadrons from the battle for France. Had Dowding not written the letter, and Churchill agreed with its conclusions, then the defeat of Allied forces in France might have meant Britain’s capitulation to Nazi Germany. After all, there would have been no Fighter Command left to fend off the Luftwaffe. 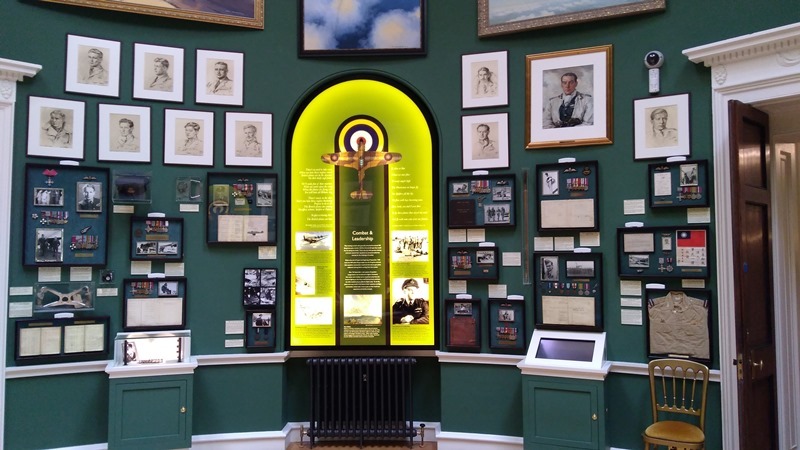 Moving down the hallway into the Rotunda, visitors are greeted by an amazing collection of portraits, medals, pilots log books, original World War Two artefacts and Battle of Britain memorabilia. As well as providing wonderful vignettes of “The Few” (a collective noun for Battle of Britain pilots), the Rotunda uses wall panels and touchscreen terminals to tell the bigger picture of the conflict, the people and technologies deployed. A small collection of items that once belonged to Neville Duke immediately caught my eye. Squadron Leader Neville Duke, DSO, OBE, DFC and two bars, AFC and FRAeS was a celebrated fighter ace and later became a famous test pilot. On 7 September 1953, Duke set a new world air speed record of 727.63mph flying a Hawker Hunter. Next, you move into the ballroom that overlooks the manicured Italian Gardens. The ballroom served as an Operations Room from 1937 to March 1940. The Operations Room was then moved to an underground bunker just before the Battle of Britain started. A mock-up Spitfire cockpit proved very popular with the younger visitors. The ballroom can accommodate around 120 people, so ideal for corporate events and private functions. A critical part of the Dowding System of air defence was the Filter Room. The Filter Room at Bentley Priory has been lovingly recreated as part of the Museum’s exhibition galleries. Mainly staffed by members of the Women's Auxiliary Air Force (WAAF), the Filter Room collated information coming from the radar stations dotted along the coast. Only once enough data had been collected to reliably plot the track of enemy aircraft would the information be passed along to the appropriate Operations Room to organise a welcoming party of Spitfires or Hurricanes. Filter Room information was also used for air raid warnings and anti-aircraft batteries. Finally, take a look at the Queen Adelaide Room and grand staircase before heading for the museum’s café for tea and cake. The museum volunteers are immensely helpful, knowledgeable and friendly. The museum provides a range of primary and secondary school learning experiences such as Plot the Battle of Britain. A tour of the museum takes about an hour and a half, so why not double-up with a visit to the Battle of Britain Bunker at RAF Uxbridge or the RAF Museum, Hendon, just 11 miles away. The museum has ample parking for cars and coaches but isn’t so easily reached by public transport. The nearest Tube station is Stanmore, but you’ll need to get a bus from there or be prepared for a 40 minute walk. Sir Hugh Dowding is one of the lesser-known Allied commanders of World War Two. Sadly, Dowding was the victim of political manoeuvring within the RAF and at Westminster, not helped by his own brusque personality. He was replaced as head of Fighter Command in November 1940. He retired from the RAF in 1942. Certainly, it’s a great shame that Hugh Dowding is not better known for his extraordinary contribution to the technical advancement of the RAF and defence of Britain.